Each quarter tech giant Akamai publishes a “State of Internet” report. The report includes data gathered about attack traffic, broadband adoption, mobile connectivity and other relevant topics concerning the state of internet and its usage, as well as trends seen in this data over time. 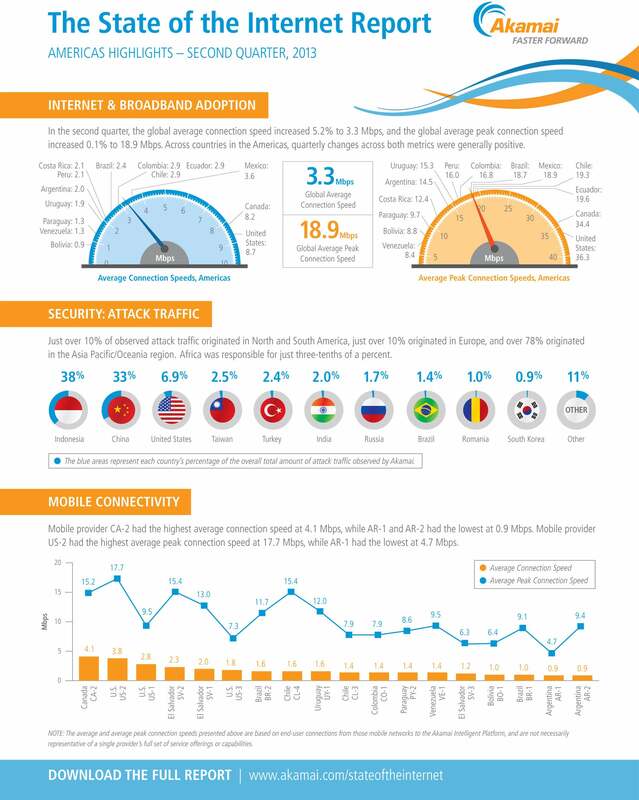 Global average peak connection speeds increased slightly during the second quarter of 2013, up 0.1 percent to 18.9 Mbps. Year-over-year, global average peak connection speeds continued to demonstrate solid growth, rising 17 percent. Quarter-over-quarter, the global average connection speed rose 5.2 percent to 3.3 Mbps (up from 3.1 Mbps). Year-over-year, average connection speeds were up 9.2 percent, with nine of the top 10 countries/regions demonstrating positive growth of more than 10 percent. Global high broadband (>10 Mbps) adoption rose to 14 percent thanks to a 13-percent quarter-over-quarter increase. 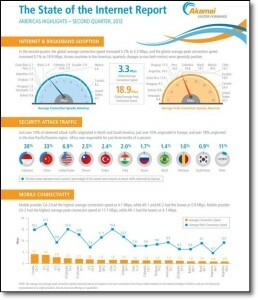 In the second quarter, Akamai observed attack traffic originating from 175 unique countries/regions, two fewer than was observed in the first quarter of 2013. The top 10 countries/regions generated 89 percent of observed attacks, up from 82 percent in the previous quarter. Like the first quarter, Indonesia and China again originated more than half of the total observed attack traffic. More than 752 million unique IPv4 addresses from 242 unique countries/regions connected to the Akamai Intelligent Platform, a 2 percent quarter-over-quarter increase and 13 percent more than the second quarter of 2012. Since a single IP address can represent multiple individuals in some cases – such as when users access the Web through a firewall or proxy server – Akamai estimates the total number of unique Web users connecting to its platform during the quarter to be well over one billion. “The Second Quarter, 2013 State of Internet Report notes some significant milestones and trends, including the fact that half of all connections to Akamai occurred at speeds of 4 Mbps or higher, a 25 percent increase since the first quarter of 2012,” said David Belson, the report’s editor. Based on data derived from Akamai IO for the second quarter of 2013 state of Internet report, mobile devices on cellular networks using the Android Webkit accounted for slightly less than 38 percent of requests while Apple Mobile Safari saw nearly 34 percent of requests.